I have been going through the FAQ archives and gathering your comments to form a kind of guide for myself. The results are below. The category breakdowns and anything in brackets are my additions / clarifications. I wanted to share in hopes the summary might help other FAQ readers. Thank you for sharing everything on your site. Happy holidays. In the markets, just about everything works sometimes, and hardly anything works all the time. The best indicator I know is Trend. The other good ones are Trend and Trend. There is no best [trend] system, any more than there is a best car. There might, however, be a best car for you. My views on trend following stay about the same. In Trend Trading we have two indicators: up trend and down trend. You can determine the trend in various ways and you mostly get the same result, depending on your preference for computing short-term or long-term trends. You can take a chart with one-day bars, stick it on the wall, step back a few feet, determine the trend and enter orders accordingly. To compute a trend, you have to compare average prices now with average prices then. Trend measurement requires averaging so you cannot define a trend until after the fact. The main difference between trend systems is the time constant, that defines how long it takes to register a change in trend. I do not publish the exact parameters as I do not wish to purvey rather arbitrary values as some kind of "magic formula." Long-term trading has an advantage, in that the transaction costs are small relative to the average move. Short-term systems tend to succumb to transaction costs. I do not know of any systems that are 0% discretionary. Trading algorithms [trend systems] are a part of trading, other important parts are risk management, attitude and knowing how to deal with feelings that arise during trading. Part of back-testing is to determine position sizing and risk management strategies that fit within your drawdown tolerance envelope. No matter how you enter and exit trades, be sure to have position sizing and risk control methods in place. Many technical traders keep risk per trade at about 1/2 %. [Response to reader] You seem to be asking for a way to get on the big trends without having to suffer through the drawdowns. Nice fantasy. If comfort is your goal, stop trading. If you want to trade consistently, without the swings in confidence, then you have to learn to accept, even celebrate, the feeling of uncertainty. This is the work of the Trading Tribe [TTP]. Thank you for posting your guide. I've been receiving lots of texts and calls from friends, and people I haven't heard from in a while, regarding Bitcoin - what my general thoughts are; whether to buy it or stay away; is it in a bubble or not? So I thought it'd be a good idea to take a look at some of the biggest bubbles over the past 40 years. 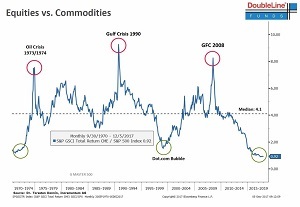 We’ve seen bubbles in may different asset classes - stocks, agriculture, metals and energy. I’m sure there are few I’m missing, but this is just to put Bitcoin's current price action in perspective versus past bubbles. At the peak, prices sit 50% above the 300-day exponential moving average (EMA). Then prices collapse 70% over the following nine months. At the peak, prices sit 67% above the 300-day EMA. Then prices fall 53% over the following years. At the peak, prices sit 69% above the 300-day EMA. Then prices fall 84% over the following three years. At the peak, prices sit 85% above the 300-day EMA. Then prices fall 72% over the following years and still remains depressed today. At the peak, prices sit 150% above the 300-day EMA. Then prices fall 69% over the following years and remained depressed for a couple of decades. At the peak, prices sit 160% above the 300-day EMA. Then prices fall 87% over the following two years. At the peak, prices sit 180% above the 300-day EMA. Then prices fall 95% over the following two years. At the peak, prices sit 323% above the 300-day EMA. Then prices fall 88% over the following three years. Currently, prices sit 500% above the 300-day EMA. If you’re trading this instrument today with zero plan, then may God have mercy on your soul. Thank you for sharing your thoughts and research. I'm happy to see FAQs is updated. It hurts to see the extreme damage you and many others suffered in Puerto Rico. "The proper use of emotions begins by accepting that they measure the difference between what we mapped and what we experience. As such, every emotion is useful and provides valuable information. Perhaps the map was off, perhaps our skill in the experience was deficient. Either way, we can change our emotion by changing either what we’re thinking or what we’re doing or some combination of the two." Thank you for sharing your process, your feelings about Puerto Rico and your wisdom. In TTP we do not seek to change our emotions; we seek to experience and celebrate them. I weep as I think about dictatorships, socialism, government control of an economy, and the true cost of the promise of free stuff without having to work for it. Thank you for sharing your process and feelings about the situation in Venezuela. I have been on your website, read the ground rules about Trading Tribe, read what people send you and your answers to them. And I do not understand what is the point of it and the benefit to them. I strongly wish be part of an association of people who commit to excellence, personal growth, and supporting and receiving support from each other, as is mentioned on your website. Would you kindly be willing to help in the shortest time available to you? Many thanks, Thank you for sharing your process - and for telling me you do not understand the point of it all. You might consider taking your feelings about <the shortest time available> to Tribe as an entry point. Could you please explain this to me a little better for me to understand? 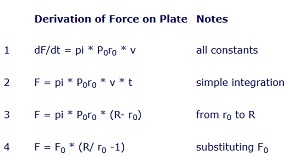 Note that force (4) is independent of velocity and the size of the gap. Force depends on the ratio of the disk radius to the orifice radius. I want to know how the ratio changes the force. Is it a small orifice to big disk radius that gives more force with low pressure/ velocity? Can you please give me some examples so I can better understand? Thank you very much for showing me the truth of lift and for your time to help me understand. Thank you for your perceptive and constructive comments on Radial Momentum. I salute your diligence, curiosity and willingness to sound off about things you find unclear. Thank you for drawing my attention to a math error. In this case, the gap is relatively wide and the levitator draws all the airflow the pump can deliver. The well pressure is relatively low. P0, the pressure just past the valve is the same as the pressure in the well. Friction is about zero and the velocity is constant to the edge of the physical disk. The time for a ring of air to traverse the plate, t = (R- r0)/v. The force on the plate of the air in the well, F0 = pi * r0^2 * P0. 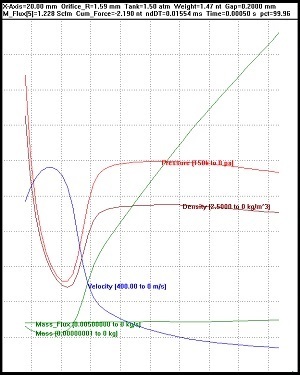 My mistgake lies in my declaring velocity constant from r0 to R.
More to the point, we have relatively constant pressure and density out beyond the active region, except for a small gradient that motivates flow out of the device. Inside the cavitation ring, we have a low u-shape for density and pressure. Since we have constant mass flux, pressure and density as the ring of air expands, we have velocity inversely proportional to radius. Equation 4, that you call into question, follows from this error and has no particular meaning or relevance - and stands in line for revision. Ro lies to the left; R to the right. I am a big fan of Trading the futures markets. I have been attempting to be successful for three years. I live in[City] I run a dumpster biz I just opened 6 months ago to stay out of car biz and corporate BS and focus on myself and my trading skills. My current area of mastery is trend trading under my mentor [Name and Location]. Even being part of a trade school it is a lonely life. I too am a big fan of music and I also believe we are in Assimilation of Govopoly but at this point no one cares and I can’t talk to any normal person about it because their mind is not on the concern. I feel life mentorship from original smart people is hard to find these days. Mr. Seykota, I have sent you a copy of the book I recommended you read. Please read the first 3 chapters. If you gain some truth which you can apply in your daily life then please let me know. Reading and applying is critical. The truth will add to your life. The truth will bring you closer to the unity of the created we live in. Yet the truth will humble us and thru humility we will create a vessel that's open to truth wherever it can be found. Seasons greetings , I am, sincerely. You should live and be well and I should only hear good news. Thank you for telling me what I should do in order to get to the Truth. The word, "should," indicates obligation, duty, or correctness - and predilection toward control-centric relating. You might consider eliminating "should" from your vocabulary for a while and then taking your feelings about <emotional closeness> to Tribe as an entry point. I have a historical tendency toward mediocrity. I can win and have a little success but I do not feel comfortable with consistent winning or big leaps in success. I start winning again recently. I start to feel a quesy feeling in my head and stomach when I think of this most recent win streak. Today I lose a little bit and the queasiness gives way to other feelings. As I write this I feel a little relief. In multiple areas in my life I win, feel success, then feel a rejection of success which starts a downward spiral where I hit rock bottom or give up, only to try to climb the mountain again and repeat the process all over again. I want to break this cycle, make allies with the feelings that come up when I have some success, so that I don’t have to act out this drama over and over again. You might consider taking your feelings about <winning>, <losing> and <breaking the cycle> to Tribe as entry points. I agree to not use any drugs or alcohol. Earlier I had strong feelings and I had intense pressure on my head as when I first contact you and start losing my hair a couple years ago and squeezing in my head. It turns out it was a fever, but I think it is more than that. The past couple of days I have felt very lethargic. I think I'm suppressing anger and it's coming out as a couple years. I would get up and certain times I would feel like crying and let out a couple years but not very much, just little. I find myself being really yeilding in trying to get people to like me and it's sickening. Im just feeling very lethargic. And when I contact you about the maid thing, I was watching a video that my mom shared on our family chat showing my nephew in the car and the turned the camera around and this maid was there and immediately I start to rub my forearms together trying to get rid of whatever's holding me. I hope I will be able to see you or get your assistance whenever strong feelings start to come up. You might consider taking your feelings about <your forearms> and about <holding back> to Tribe as entry points. 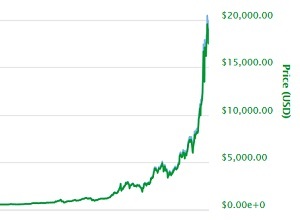 You might find this chart of interest. I hope you have enjoyed 2017 and that the coming year finds you even more joyous. I want to share a photo that documents one of my joyful moments of 2017: the completion of a restoration of an old, non-functioning windmill that sits on the property I have purchased as my retirement home. It was just overlooked and taken for granted, broken down and written off, until a little spark ignited in my imagination that said, "How cool would it be if that windmill could not only function, but serve a purpose!" The renovation process was more complicated than even the windmill guy anticipated, but yesterday the top was finally installed and my windmill is now pumping water to keep my swimmin' hole full! No worrying about evaporation in the summer or overgrowth of algae, thanks to a continuous influx of fresh, cold water driven by the wind. And it is located where I can sit on my front porch and enjoy the view, just as you see it here. I am told it is unusually tall, and that the triangular base is also rare now that most newer windmills sit on a four-sided base. The whole thing, plus my impending retirement this year, feels so incredibly special to me that I want to share it with you and your readers. I credit my experiences with the Trading Tribe for much of the personal growth I have experienced in the past few years. Thank you for being a part of my dreams coming true. Thank you for sharing your process and photo - and for applying and helping to extend TTP - and for living your dream. According to the available data, Inflation is 2%, unemployment is 4.1% and trending down. Evidently, 2008 bank bailout is working for the general public. Do you think government intervention in a situation like this is necessary? I wonder, what would happen if the government would not take any action. According to the available data, I play banjo on Friday - and - we have no sightings of elephants roaming around in Austin Texas. Evidently, playing banjo on Friday keeps elephants away. I would like to attend your early 2018 workshop. Thank you for expresing an interest. I recently run some simple EA crossover system test, selecting a stock data as sample. (1) The test shows 19 times to entry. (3) The average return decreases to 0.74% if I take the biggest profitable out. Becasue the average return decreases from 62.46% to 0.74% if I take the biggest profitable out, and ,Win/Ratio seems low, how would you evaluate the performance of this simple system? And, could you provide me some insight you get from such test result? You can run back tests to gain insights and you can use MAR, Sharp Ratio, Sortino Ratio and the like to evaluate performance. I have been a fan for a long time. Quick question about risk management, correlation and forex pairs. Often times when looking for a set up I see multiple set ups appear for the same currency vs. other currencies (gbp/aud, gbp/nzd, gbp/cad). When trend trading, if I was using position sizing of 2% per trade, would you break it up into 1% per trade and trade 2 of those pairs? Or would you take all of the trades? Or would you just take the best one? Any advice would help, thanks. You might consider taking your feelings about [designing and trading a definite system - versus - trying to figure out what to do as you go] to Tribe as an entry point. I read your book The Trading Tribe, and now, it is my favorite book. It's a guidebook for me to move toward righ livelihood. I begin to reread it to go deeper into this book, at the same time, go deeper into myself. but I accpet this feeling, maybe it would change in the future, which I can not predict. I just accpet it in NOW and i feel good for this feelings. It leads me to think more on this book, which I think is the good side of this "favorite" feeling. Now I want to translate the book to Chinese, so my families can also read it too. It's so good a gift that I must share it to my families, I have 2 brothers and 2 sisters. Not for commercial use, if you agree, when I finish the translation, I would send it to you and you can post it on your website. I think my translation might be very good, becasue your SVO-p writing style makes it very easy. Waiting for your reply if you provide me the permission to translate it to Chinese, as my gift for my famalies. Hope this email find you healthy and happy. Best wishes form a young man living in China! Yes, you may translate The Trading Tribe into Chinese so your family can read it. Please distribute paper copies only. Please send the digital version of your Chinese translation to me as I may wish to process it further and then publish it. You might consider re-translating your Chinese version back into English (with translation software) to confirm the meaning remains intact. I check-in with you to see how you're doing. I share a recent success of bringing in a new client. This is my first new client in a very long time. You ask how I attract this client, and my answer is, I do nothing. The new client calls me completely unexpectedly. Prior to receiving the client call, I recall feeling confident and developing an attitude of "if people want my services, fine, if not, that's fine too". Previously, my habit is lots of hand-wringing and worrying about "how I am ever going to find new clients?" You: Where is this feeling, physically? Me: It's in my stomach. You: Good. Can you tell me more about this feeling in your stomach? Me: Sure. It feels like a ball. Not painful, just there. You: What is this ball trying to tell you? You: What temperature is the ball? Me: It's room temperature, not hot, not cold. You: What color is the ball? Me: Green. It's a green ball. You: How big is the ball? Me: About the size of my fist. You: Can you make the ball bigger? You: Really get into that feeling. I get into the room temperature, growing green ball stuck-in-my-stomach feeling and I vividly recall something that happens when I'm three years old. I can see everything clearly, as if it's happening in real-time. I'm alone and playing a game by myself. The game is: roll a penny down a paper tube into my mouth. It just-so-happens I choose a tarnished-green copper US penny for this game. I have fun for several tries, rolling the penny into my mouth, spitting it out, and doing it over again. On the fifth roll, the penny goes down my throat and gets stuck. I recall feeling shock, fear, and a lot of discomfort. I swallow a bunch of times, and still feel it in my throat, then eventually in my stomach. As I type, I can still feel the sensation of the coin going down my throat. You ask who taught me this game. I say the toy clown bank. 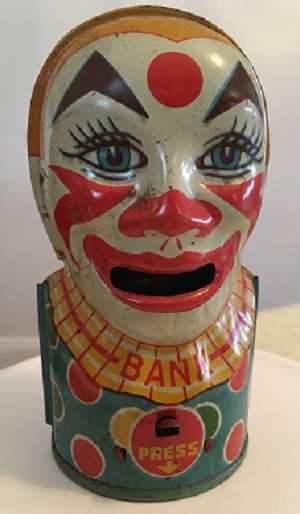 I remember having a toy clown bank where you place a coin on the clown's tongue and he swallows the coin. You: This coin has been protecting you. It's been a silent sentry in your stomach nearly your entire life. You: In all this time, it has been doing its job, protecting you, without any acknowledgment. A silent soldier, showing up every day. Would you like to say anything to your faithful sentry? Me: Yes. Thank you for all your years of service, and I'm sorry, I haven't even noticed you were there. You: Great. Now what do you want to do with the coin? Me: I would like to get rid of it. You: OK, well how would you like to get rid of it? You: Go ahead and make it small. Is it small? Me: So tiny it cannot be seen. You: When we’re done are you ready to pass the coin? Me: Yes. I'm thankful for the coin, and ready to let it go. I always remember its lessons that protect me, from bringing in money that's not appropriate, and from situations in which my services would not be a good fit. You: Is this new client appropriate? Me: Absolutely. Without a doubt. I feel grateful for my coin-sentry, and grateful for your observations and deep caring and interest in working through the process with me. Per your suggestion, I locate the actual bank, and attach a photo that I plan on adding to my office wall. The next day I attend a social event and meet someone new who seems very interested in what I do. We set a meeting to discuss Trend Following 101.
can teach you a lot about money. Bank by J. Chein and Co, circa 1940's, tin, 5-1/16 inches high. You deposit money into the bank by pushing a lever near the word "press" and placing a coin on the tongue that extends from the clown's mouth. You deposit the coin by releasing the lever. Thank you for sharing your process and for documenting the work. Note: I conduct this session by telephone. I recall Hotseat electing not to "pass" the coin after all - and to "keep it around" to remind him to accept only clients that fit with his trading strategy. During the session, Hotseat operates in a mild trance state. He notes his report as "to the best of my recollection." This case illustrates how an aversion to "swallowing money" can easily translate into an aversion to accepting new accounts. Re-framing these feelings as due diligence during the client interview can empower rather than inhibit his marketing function. You reply "I wonder if you might like to help complete it." Yes, I do like to help complete it. I do like to do something that benefits me. TSP, as you said in the website, is an opportunity for readers of FAQ to participate in the design, verification, testing and implementation of an actual trading system, from Ground up. In my mind, it is like a on line workshop and I like it very much when I find it on your website. I think, through following along with the evolution of the project, I can master the basic skill and find some important details, which helps me to develop my own system. It seems that, in TSP, you briefly give a refined introduction to every sub-project, like providing an entry point, and then readers of FAQ participate to test and verify, executing the DIM process in their own side. Now, there is only titles of remaining sub-project, it seems that these topic waiting for you to active. I'm sure i will participate and help complete it together with other participates once you providing an entry point to active them like before. You may begin by picking one of the titles and writing something about it. Thank you for taking the time to reply to my message. I am currently in Brazil, in Porto Alegre. I am still very much interested in meeting you and learning from you as well. Let me know if there is any possibility to do so in the future. We can meet in person, briefly, if you ever visit Austin. I can work with you on FAQ, for free and also privately. See Ground Rules, above. I do not how to do anything in the future. Perhaps, in the ever-evolving moment of now we can make an agreement - and then continue to keep that agreement in the now - until we meet, according to that agreement. ​S​ince I read about your story in Market Wizards, I've been thrilled by it. I have often read your website and find it fascinating how many people you have helped. I'm a little worried if you're okay, because the last posts on your site are from the beginning of this year. I hope it's all good. From the viewpoints of trading we have many points of contact. I also use the technical analysis a lot for my trading decisions. What thrills me about your view of trading from the very beginning is the point that you see trading and psychology as an inseparable point. I share this view with you! What we still have in common is the point that I also try to pass on my knowledge about trading to others. I am a trader here in Germany and have been leading a group of IFTA here in Germany for a long time. I am currently working on a book project. The book is about hedging. I have had the experience that many traders are afraid to make losses in the markets. They then try to secure their positions with less promising methods. However, this often does not lead to the desired result. I would like to inform the traders about this. I would like to point out when hedging makes sense and in which situation it is better to use a stop. I would be interested in your opinion on this subject. I would be very happy if I could send you a few questions on this topic and use your answers in my book. I wouldn't change your answers, just have them translated. I assure you of that. The book is published by a well-known German publishing house, which also holds the German rights for "Market Wizards" and publishes the book there. Thank you for sharing your process and for inviting me to answer questions for your book. On FAQ, I consider issues that appear in the lives of the FAQ readers. You might consider, for your book, reaching out to someone else who has a background in hedging. something you would like to change about your trading.] and as I pondered further, I couldn't come up with a simple answer, which is the reason for my delayed response. It has come to my attention that although a lot of the data indicates I should trust the system i built, I find myself sometimes not trusting the ups and downs of my trades, which leads me to sometimes cut my losses a bit too soon. Psychologically, perhaps I don't trust myself sometimes. In my previous life, as a professional, I've somewhat succeeded in my career as a Software Architect, Project Manager and College Professor, which I am still doing to pay the bills, and it's there where I completely trust myself. How can I channel that confidence to my trading? Is it just a matter of experience, which means I am at the mercy of time? I remember when I first started learning C++ in school, I failed a course called Data Structures, which teaches you all about the object oriented features of C++, and binary trees, linked lists, etc. After I failed, I told myself I had to just give it time and try it again, and put more time into it, which eventually led me to passing that class, and giving me somewhat of a template on how to approach problems, which is simply, putting in the time, day in and day out. I am convinced that perhaps my challenge lies in my subconscious, which perhaps I need to reprogram, as I have been doing, by listening to tapes with subliminal messages, by Kelly Howell. Any suggestions would be greatly appreciated. Another quick mention, I read on one of Van Tharp's sites that you wrote a trading system in Assembly Language. I can't fathom how many countless hours that took, especially since with Assembly Language you have to be extremely meticulous about memory management. Personally I loved Assembly Language, I actually wrote a calculator program during my time in school, and it was about 1200 lines long! Such a difference between that and C#. I just thought that was pretty cool. In the recent weeks, I’ve paid a lot of attention to my physiological and emotional reactions. Also, I have made a consious decision to limit consumption of news and media “information”. I decided to spent not more than 30 minutes per week on this. Today, was my media day and after reading news for about 20 minutes I felt angry, I was sweating and I had a minor headache. When I was reading the news (I used three different sources) I felt like everyone was trying to promote their narration (interpretation of events), instead of delivering information. I felt angry on three levels: one, for wasting my time on reading their false and useless opinions. Two, for losing time and NOT receiving the actual information. Three, for forcing me out of my zen mindset. Here is the question. It’s clear that consuming media has a negative effect on me. At the same time I feel like quitting media 100% wouldn’t be reasonable as I need access to the minimum amount of information. You might consider taking you feelings about <too much information> to Tribe as an entry point.